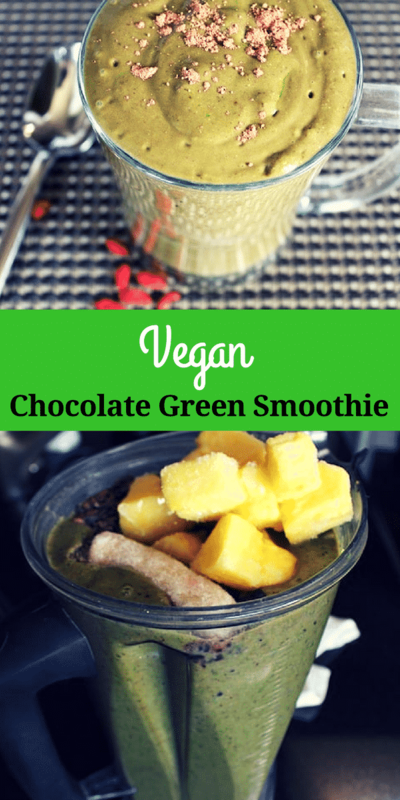 This Vegan Chocolate Green Smoothie recipe is a delicious, dairy-free concoction full of nutrition and chocolate flavor. I’ve written a lot about green smoothies before including my Collard Green Smoothie, my Cantaloupe & Spinach Smoothie, and my Sweet Watercress Smoothie. Today, I present you with my Choco-Green Smoothie! 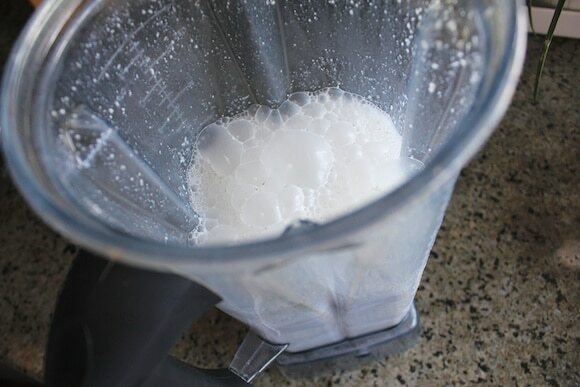 You wouldn’t necessarily want to drink this milk plain because it will taste pretty grassy (I can’t think of any other way to describe it) and will separate easily, but it works perfectly as a base of a green smoothie. My ratio is about 1/4 cup seeds (any combination) to 3 cups water. You could definitely alter the fresh or frozen fruits in this recipe, but I find that it works to have at least some of the fruit fresh so the whole thing blends easier. Un-frozen bananas are a great option. Or, you could also put some of your frozen fruit in the fridge overnight to defrost and use the next morning. Deciding on your greens is important, too. I tend to rotate between spinach, collard greens, kale, and romaine for my green smoothies. It’s actually really important to switch up your greens since some of them are high in oxalic acid and, besides, variety is the spice of life, no? After another blend, it’s time to add the final round of ingredients: the chocolate, the frozen fruit, the flax, chia seeds, goji berries, and lucuma powder for added sweetness (totally optional). 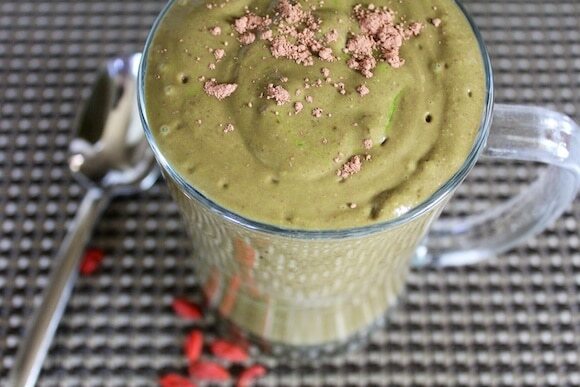 A dairy-free green smoothie with tons of nutrition and chocolate flavor. 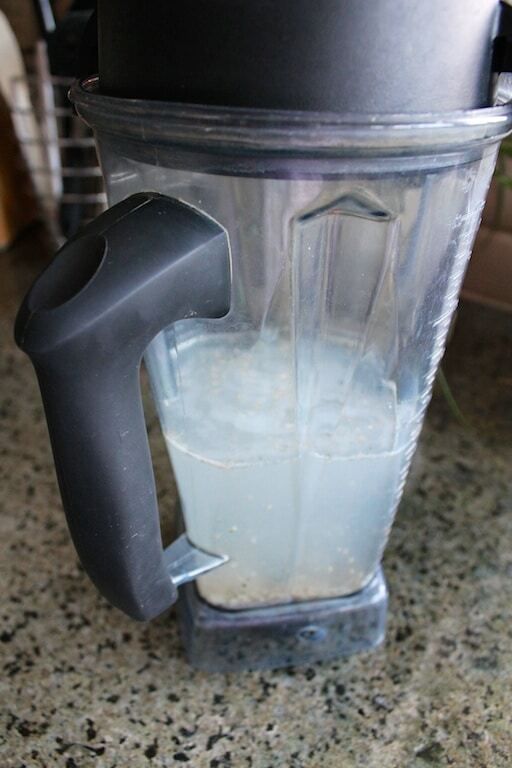 Combine hemp seeds and water in a high-speed blender and process until smooth (about 15 seconds). Peel the mango and add to the blender along with the fresh strawberries. 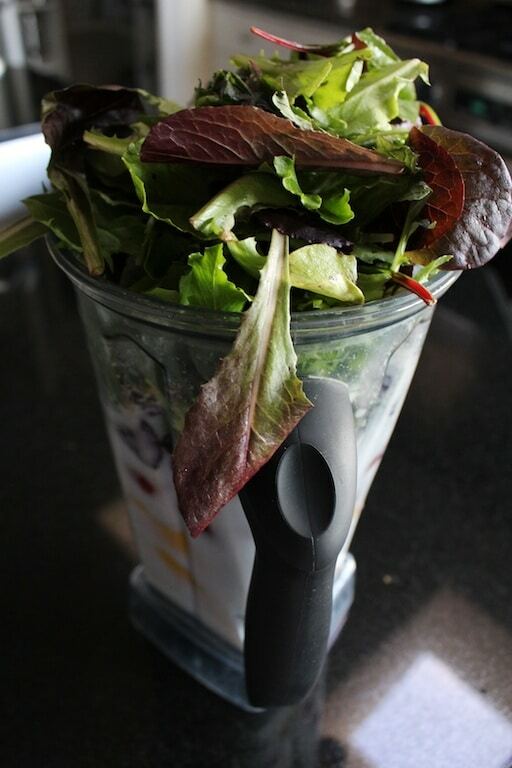 Add the banana, romaine or spinach and blend again (about 30 seconds). Add flax meal or chia seeds, frozen pineapple, cocoa powder, and lucuma powder to the blender and process one last time until smooth. Serve cold and refrigerate leftovers for up to 24 hours, tightly covered. 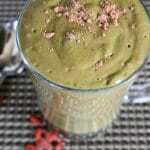 I love your blog, smoothies and recipes, there are so much healthy ideas here! I have a couple question for you regarding the smoothie (s): when you make this and it yields 4 cups, how much of it do you eat/drink in one sitting? Do you freeze what is left or just store in your fridge? And do you drink it all in one day? I want to make this smoothie as it is similar to the ones I like and make myself and I know I will totally enjoy, but I also know I am probably not be able to consume all in one day. I am thinking about making 1/2 recipe, but not sure I will drink 2 cups at once…. I may though as my smoothies are always thick, creamy and voluminous, lol! Thanks for sharing this recipe and all the other awesome ones you have in your amazing blog! Hi Ana! I should clarify that this makes 4 servings, not cups. It is probably more like 12 cups total! What we do in my house is drink half of it the day it’s made (shared with my husband), and then drink the rest the next morning. You can also freeze the leftovers and then just defrost in the fridge, I did that last year before my thyroid cancer surgery and I do that before I travel sometimes so I can take along the frozen smoothies to defrost in the hotel fridge. Ahhhh, then 12 cups is a whole lot, I would need to reduce the recipe even further. This look amazing Carrie! :) I use cacao in all my smoothies. It really gives me great energy and my skin never looked better. I know the extra iron also helps, and it’s such a great source of antioxidants! :) I’ve wanted to use hemp milk in a smoothie for some time now, so thanks for the extra dose of inspiration! :) I love this smoothie! So lovely:0 I also love using frozen cucumbers instead of fruit since I’m sensitive to sugar, and use a recipe similar to this one:) LOVE IT! Patty, thanks so much for the supportive words! I’m so glad you liked this smoothie recipe, as well as the way I put it together. I definitely feel as if we are friends, too, which is one reason why I love blogging so much. I’ve met so many incredible people, including yourself, that I never would have met otherwise. Hugs!!! 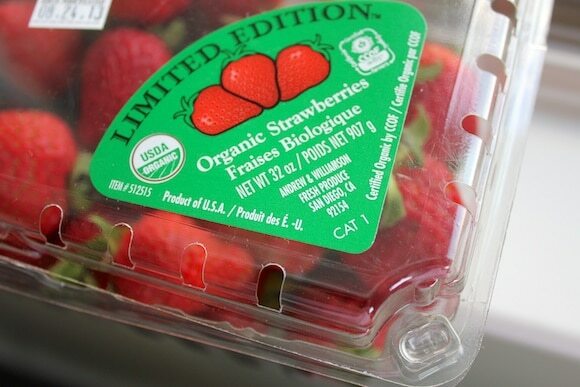 The ‘limited edition’ strawberries made me chuckle. I love your idea for speedy non-dairy milk! mmmmmmmm yummy! I TOTALLY agree with getting more flavour with cocoa instead of cacao and also the quantity needed being much less! And that sure adds up with the cost of cacao out here – not sure if its the same where you are or not but its soooooooooooooo expensive here! I like reading your posts and I like it when ‘health claims’ are backed up by a study. Thank you for sharing and I’m learning a lot from you. I love chocolate ( who doesnt?) but I rarely eat them. Now, I can enjoy chocolate in my smoothies. I recently moved back to the Philippines and we have plenty of cacao here and there’s a lot of veggies that are new to me . Sometimes, it’s so hard to find substitutes for the green veggies that I used to make smoothies the US. We don’t have favorites, kale and spaghetti squash. There’s a lot of ‘super greens’ though and most local fruits and vegetables are organic. I just have to keep on experimenting ang most importantly writing down what tastes good and not. I almost sold my Vitamix before relocating. I am so thankful I brought it here ( but have to use a converter )I can’t live without it! P.S. You should start a blog! I would love to read about what life is like where you live. I have been wondering about adding in some cocao. I think I may pick some up this weekend. Thanks for the recipe. I just wrote this super long reply, and it gave me an error! comment gone. boo. 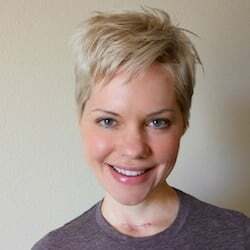 What I was saying was that as someone who has been recovering from CFS for almost 3 years now, I’m really skeptical of this small (10 person) study. Chocolate, in it’s various forms, will give me a lift but to maintain it I need to eat more of it. Also, the buzzing energy becomes more of a nervous jittery feeling, and I would still be too fatigued to exercise off this burst of energy. They didn’t formally assess the participants physical activity, so it’s anyone’s guess how much the chocolate really improved their CFS. The study has a chart showing what exactly was in each of the chocolates. the “fake” chocolate had twice as much sugar and also contained whole milk and whey powders. It’s no wonder those test subjects felt worse during the study. Sugar and dairy are two of the most energy draining things for CFS. They also mention that 2 of the people in the study were able to return to work. I wish it were as easy as eating chocolate to heal from this, but treatment is complex and involves permanent lifestyle changes. I’m not trying to say that chocolate is the devil or anything, but I do think that it’s wise to avoid chocolate and any other stimulant foods when recovering from CFS. 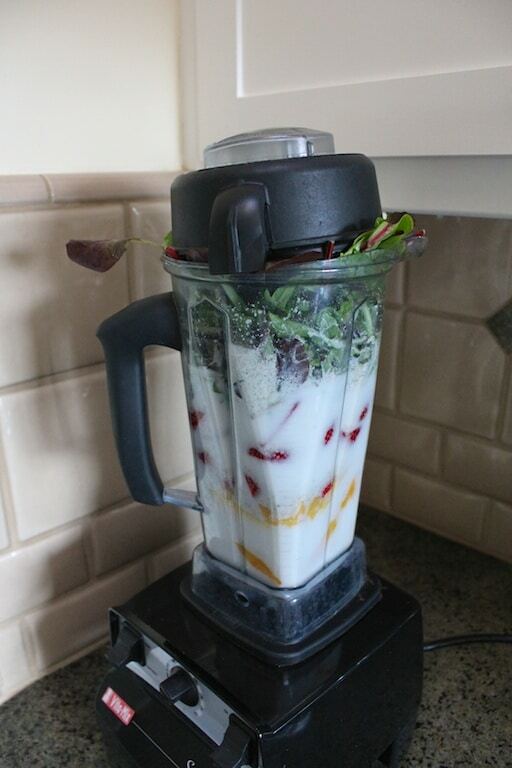 You’re smoothie looks super yummy, btw. I might have to make some with carob! Mmm…that sounds awesome. I think I’d want to use strawberries, raspberries, and cherries. I’m a big fan of chocolate in my smoothies. This was an amazing smoothie recipe because you included a lot of ingredients that I don’t normally use in my smoothies. I do use Hemp milk a lot, but I need to use sesame seeds more often because they are very nutritious. And of course, collards, lucuma and goji berries are so healthy for us. 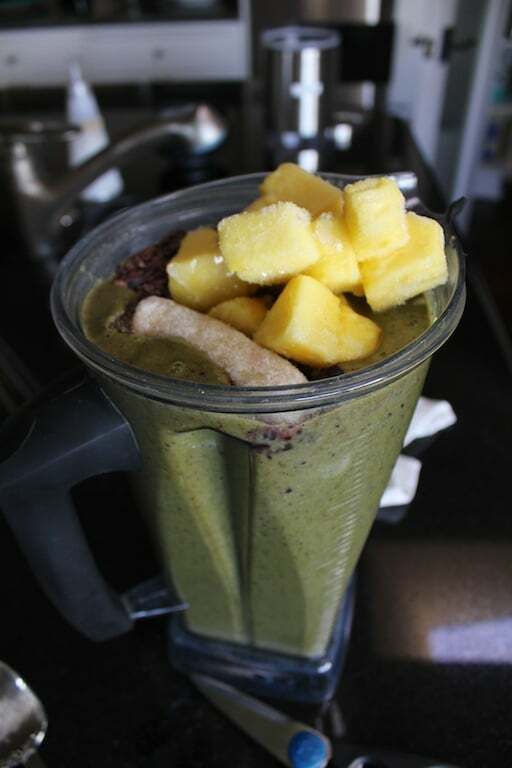 This smoothie (with the extra boost of chocolate) should have you bouncing with energy all day! Is it necessary to soak your sesame seeds overnight or not for this smoothie? Hi Deborah! I do not think that sesame seeds need to be soaked. I do use the unhulled (brown) version though, because they are a richer source of calcium and other nutrients in that form, as opposed to the white hulled version. It was a bit tough to find the unhealed sesame seeds, but Bob’s Red Mill sells them and they are in the bulk section of my local health food store. This smoothie sounds so good! And I have to admit, I’m happy to see you are eating some chocolate. I think it’s ok to have some things we really enjoy in moderation. I have a bit of a choco-problem myself, but I like it so much that I have a hard time swearing it off. I think it can be healthful too actually and it sounds like you don’t have it very often anyway. 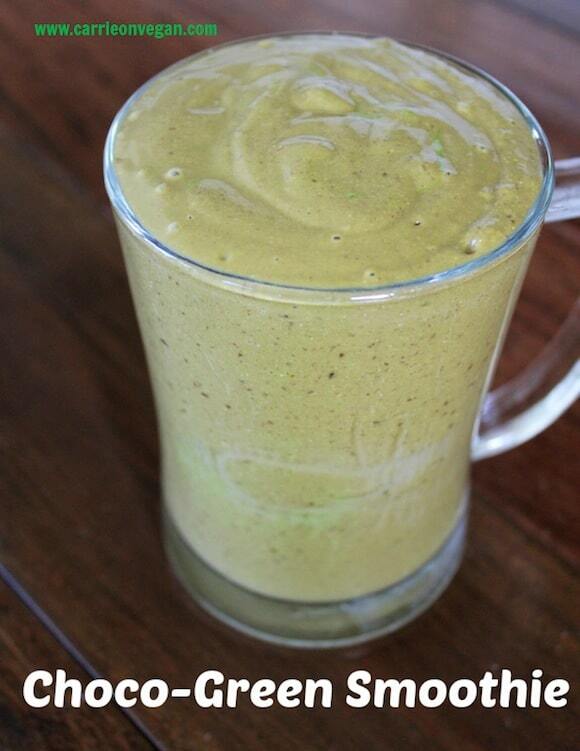 Another great smoothie for my green smoothie recipe collection.